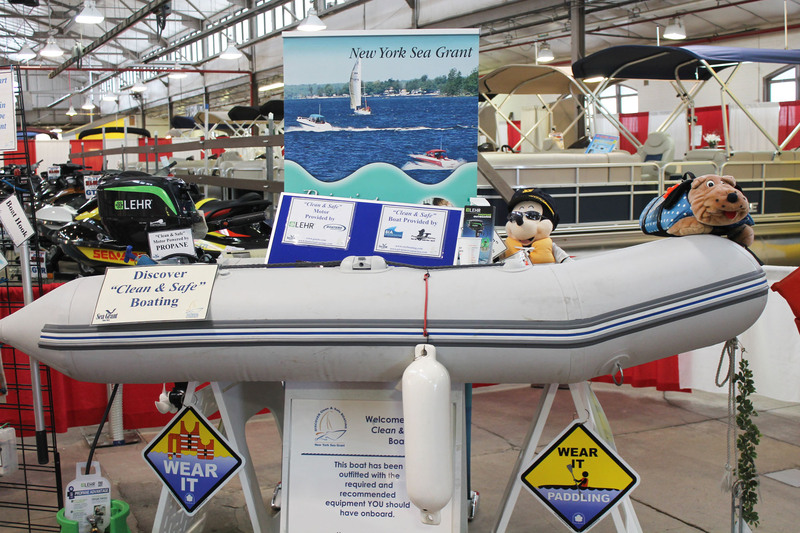 OSWEGO, NY – The 10-foot inflatable boat that is the New York Sea Grant Discover Clean & Safe Boating educational vessel for 2015 may be a small boat, but it carries a big message. No matter what size boat you have, observing clean and safe boating practices helps everyone enjoy the water. 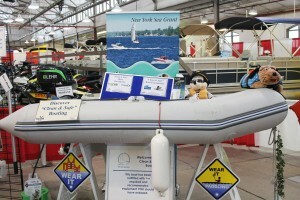 The boat is equipped with a propane engine and traveling to boat shows, events, and venues throughout Upstate New York educating the public about the equipment needed and mandated for safe, environmentally-friendly, and legal boating on the recreational waters of New York. 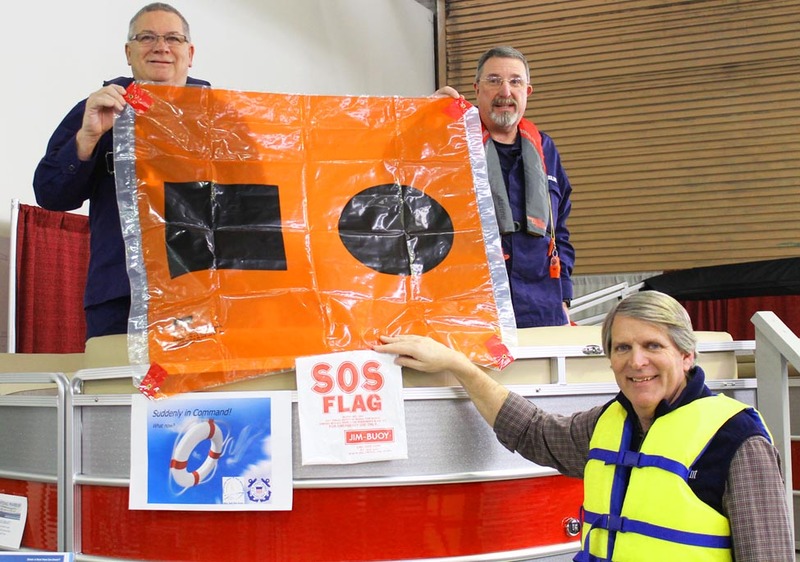 A new component for the campaign in 2015 is a fun, but serious introduction to Suddenly In Command training for people who enjoy boating but do not know how to operate a boat or properly signal for help. New York Sea Grant and the US Coast Guard Auxiliary Flotilla 21 are partnering to instruct people on the boating basics they need to know in the event of an emergency on the water. Several marinas have requested the program for their sites once the 2015 boating season gets under way. 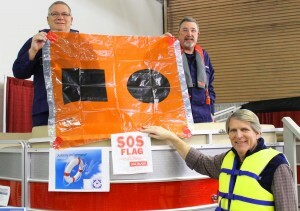 From left: US Coast Guard Auxiliarymen Dale Currier and Gene Little and New York Sea Grant Coastal Recreation and Tourism Specialist Dave White unfurl a marine distress flag as part of educational programming at the 2015 CNY Boat Show. 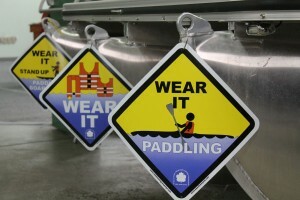 New York Sea Grant offers boating safety resource links for selecting the right life jacket, developing a float plan, requesting a courtesy vessel check and more online at www.nyseagrant.org/marina.
. Learn about Suddenly In Command training so everyone aboard can be prepared to act calmly and properly in the event of an emergency on the water.
. Make sure all passengers are wearing a proper life jacket. A throwable floatation device is required onboard boats more than 16 feet long.
. Learn how to conduct an easy-to-do Clean, Drain, Dry inspection of your watercraft, trailer and gear to remove aquatic invasive species and debris each time you enter and leave new water.
. Check that all the safety features of your boat trailer are in proper working order.
. Check the number and expiration date/s of onboard fire extinguisher/s and flares. Store flares and distress signals in dry compartment. The Suddenly In Command intro with New York Sea Grant and the US Coast Guard Auxiliary shows how to properly ignite and handle a flare. The NYSG Discover Clean and Safe Boating campaign informs boaters and paddlers about wearing a properly-sized life jacket.
. Use a fuel nozzle bib when fueling your boat and a bilge sock to keep marine fuel from spilling into the water.
. Make sure all vessel lights are working and flashlights have fresh batteries.
. Have a proper device onboard to receive weather alerts.
. Check to be sure you have the proper navigational charts onboard.
. Check that the boat horn, whistles, distress flag and other means of signaling an emergency distress are in working order. Since its debut in 2008, the NYSG Discover Clean and Safe Boating campaign has educated more than half-a-million boaters, anglers, duck hunters, pontoon boat and paddle sports enthusiasts, deaf boaters, and, in 2014, New York first responders who handle water-related emergencies. The Boating Industries Association of Upstate New York, Pirate’s Cove Marina in Clay, Lehr Engines and BoatersAdvantage.com are sponsoring the 2015 campaign. For more information, contact New York Sea Grant Coastal Recreation and Tourism Specialist Dave White at 315-312-3042.